Android is one of the most popular and even most loved OS for mobile platform. After all, it's a Google product. Although Android has many useful built-in applications but it's third-party apps which makes it unique and this much interesting. There are millions of apps available on Google Play Store for free in each single category. You can play high-graphics games, read your favorite news and use other social media apps to share your thoughts with your friends and followers. Everything is on your fingertips. You might not know that the apps you've installed in your Android phone are always running in the background, even when you and your phone screen is sleeping. As soon as you'll get the new notifications in pipeline, they will automatically push them into your phone's notification tab. For example, when someone will like or comment on your Facebook photo, you'll get the direct notification in your phone. In the same way, when someone will favorite your tweet, you'll be notified instantly. These app notifications reminds you important things and keeps you updated with latest activities. Apart from this, some apps will also send you offline notifications, such as when some technical error occurs or when action is completed (e.g. files copied successfully). After reading the notifications, you can clear them any time. That's pretty much easy and you may already know how to do that. Just open the notification tab and swipe the notification left or right to remove it. Alternatively, you can click the three parallel lines (in 5.0 and later versions) to clear them all at once. This thing may not work all the time. You might have faced the situation where some notifications are sticky and they aren't disappearing even after swiping them left or right manually. In fact, they are non-removable. It's really annoying to see them all the time. 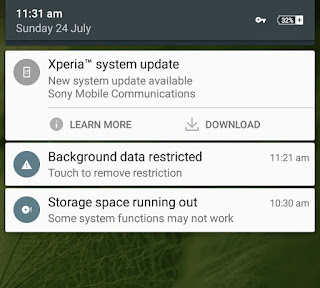 As you see in above picture, I am getting the same kind of notification as Xperia system update. 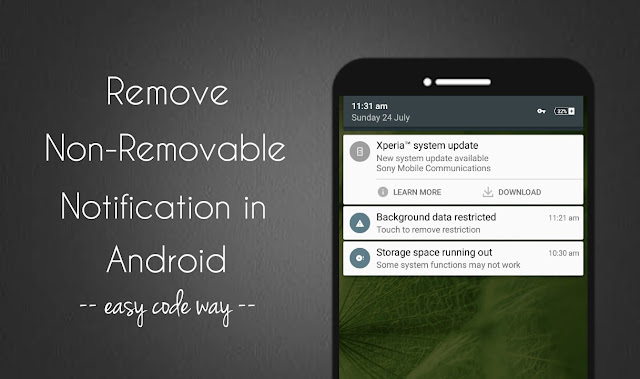 Here I have found 2 simple ways which you can help you clear such sticky and non-removable notifications in your Android phone. Scroll left to "All" tab. Here find the app name and click it. In the following window, untick the "Show notifications" button and that's it. You can enable them again any time. If there is no such button or if it's unavailable, this means that you can't take any manual action on that particular app. Here's another way to clear those sticky notifications - Just tap and hold the notification in notifications tab and then click the info icon (in 5.0 and later versions). Now switch on the block button to disable all notifications from the app. If you're running an older version of Android, click the "App info" option (instead of info icon) and that will take you to the same screen as shown in 5th step. As already mentioned, all Android apps are always running in the background. 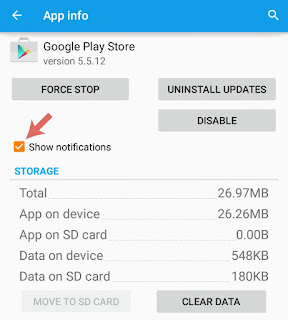 They do so for some good reasons: such as for syncing, providing location data, push notifications etc., but if you want to remove an app's sticky notification, you have stop it from running in the background. To do this, again go "Settings > Apps > All tab". Here find the app and open it. Now tap the "Force stop" button. After this, a pop up box will appear. Click OK to allow permission and you've done it. Using this method, I have successfully removed that Xperia system update notification (which is annoying me the most). This way, you can clear almost all app notifications. But note that, they may appear again after some time because the app and its services may start working again either automatically or when you'll re-open the app. Unfortunately, you can stop system notifications (such as alert, warning and other security messages). 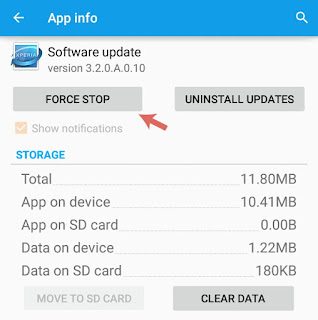 Even If you'll force stop the Android system app, your phone may misbehave or crashes automatically. So don't try this. Before force stopping anything, make sure that it's not a system built-in application. As of a general rule, leave all the apps you're not a familiar with. This is all what you need to know. If you've any doubts, feel free to drop them in the below comment box. Thanks for this info. A sticky notification was very irritating.